I’m happy again. . . .
’Tis another night of ultra-violence. Derelicts rule. Welcome to the future or the past. Either way, it ain’t no country for old men. Tramp (Paul Farrell): It’s a stinking world because there’s no law and order any more. It’s a stinking world because it lets the young get onto the old, like you done. Oh … it’s no world for an old man any longer. What sort of a world is it at all? Men on the moon, and men spinning around the earth, and there’s not no attention paid to earthly law and order no more. Guzzle potent drinks at the local hangout. Get a whole lotta high and loosen up. Exit the mind and planet, places where debauchery and mayhem cannot idle. Enter stage left. Curtains up! A dance is in motion. Committing heinous crimes is entertainment on this platform. If it feels good, do it. Do whatever comes naturally. Be a deviant. Mommy and Daddy will never know, and even if they do, so what? Only the naïve claim punishment a deterrent. Routine brutality functions as a warm up. Crime after crime shall push greater extremes. Limbs will kick harder. Higher. Mayhem evolves into one helluva show! Too much is hardly enough … until the curtain comes down. Arrest by the authorities. Gonna have to hang up those dancin’ paratrooper boots, friend. At least for now. A little time outta the spotlight promises to transform the act. Rehabilitate. Fall in line. Strip away costumes and blend in with the crowd. Be a good boy. Embrace control and order. Above of all, find Jesus. Study the Bible. Learn right from wrong. Move through gesticulations like a trained monkey. Prison Chaplain (Godfrey Quigley): The question is whether or not this technique really makes a man good. Goodness comes from within. Goodness is chosen. When a man cannot choose, he ceases to be a man. 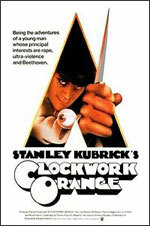 Alex DeLarge (Malcolm McDowell): I don’t understand about the whys and wherefores, Father. I only know I want to be good. Prison Chaplain: Be patient, my son. Put your trust in the Lord. Suffer. Repent. The steps are easy to learn. One. Sit. Two. Kneel. Three. Bow. And four. In the name of the Father. . . .
Good God! Saved! The transformation to an upright citizen and disciple of holiness is a smashing success and an example to humanity. A standing ovation is guaranteed. Never mind that one is oddly denied the ability to defend against a universe with hurt written throughout the script and a twisted attraction to those parts with lashings lies suppressed under model behavior. Audiences gasp at the audacity, all the while beaming with pride at a job well done. Bravo! The performer heeds direction exceptionally well. The horror … the horror. Film the madness in the movies and play it against the beauty of Ludwig van. Dichotomy accosts life as the essence of man. Alex: It was beautiful. It’s funny how the colors of the real world only seem really real when you viddy them on the screen. The creation is a most unsettling spectacle from which looking away is not an option—a grand experiment for sure. One that works. Alex: When it came to the sixth or seventh malchick, leering and smecking and then going into it, I began to feel really sick. But I could not shut my glazzies. And even if I tried to move my glazz-balls about, I still could not get out of the line of fire of this picture.